Observed on Datura wrightii, a plant related to tomatoes and tobacco. Peoria, Maricopa Co., Arizona, USA. April 2014. 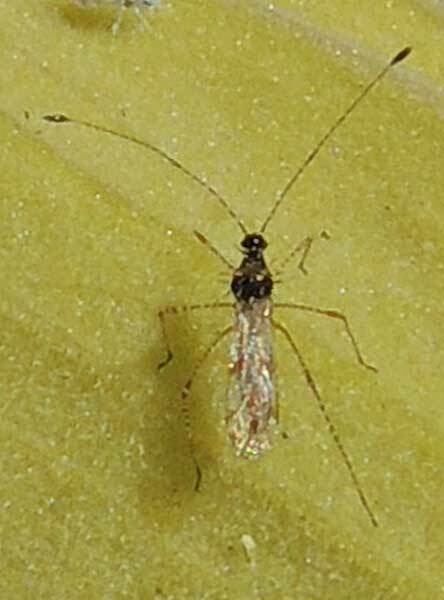 Length is about 6 mm. It is fun to speculate how the very long, ultra-slender legs serve this bug. This species of stilt bug is often found on members of plants in the Solanaceae (nightshade) that are coated with sticky hairs. Desert tobacco and cultivated tomatoes have such leaves. Sacred Datura, the plant that this specimen was on, also has sticky leaves. Maybe it allows them to not get stuck in the glue? Stilt bugs feed exclusively on plant juices that they extract through straw-like mouthparts. However, they might bite if mishandled, and there are reports that this bug's bite is painful. Copyright Michael J. Plagens, page created 19 April 2014.